Surface downward longwave radiation (SDLR) is a key variable for calculating the earth’s surface radiation budget. In this study, we evaluated seven widely used clear-sky parameterization methods using ground measurements collected from 71 globally distributed fluxnet sites. The Bayesian model averaging (BMA) method was also introduced to obtain a multi-model ensemble estimate. As a whole, the parameterization method of Carmona et al. (2014) performs the best, with an average BIAS, RMSE, and R2 of − 0.11 W/m2, 20.35 W/m2, and 0.92, respectively, followed by the parameterization methods of Idso (1981), Prata (Q J R Meteorol Soc 122:1127-1151, 1996), Brunt and Sc (Q J R Meteorol Soc 58:389-420, 1932), and Brutsaert (Water Resour Res 11:742-744, 1975). The accuracy of the BMA is close to that of the parameterization method of Carmona et al. (2014) and comparable to that of the parameterization method of Idso (1981). The advantage of the BMA is that it achieves balanced results compared to the integrated single parameterization methods. 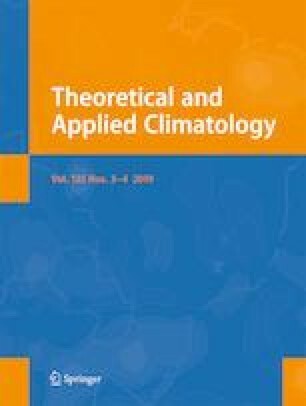 To fully assess the performance of the parameterization methods, the effects of climate type, land cover, and surface elevation were also investigated. The five parameterization methods and BMA all failed over land with the tropical climate type, with high water vapor, and had poor results over forest, wetland, and ice. These methods achieved better results over desert, bare land, cropland, and grass and had acceptable accuracies for sites at different elevations, except for the parameterization method of Carmona et al. (2014) over high elevation sites. Thus, a method that can be successfully applied everywhere does not exist. The AmeriFlux data was downloaded from http://asiaflux.yonsei.kr/index.html, the AsiaFlux data was downloaded from https://db.cger.nies.go.jp/asiafluxdb/, the CEOP data was downloaded from http://aan.suiri.tsukuba.ac.jp, the Fluxnet data was downloaded from http://daac.ornl.gov/get_data.shtml, and the SURFRAD data was downloaded from http://www.srrb.noaa.gov, respectively. This work was partly supported by the National Natural Science Foundation of China via grant 41771365, the National Key Research and Development Program of China via grant 2016YFA0600101, and the Special Fund for Young Talents of the State Key Laboratory of Remote Sensing Sciences via grant 17ZY-02.